binnaga maguro 鬢長, ビンナガマグロ Thunnus alalunga, "White tuna"
This was a speciality of Edo. the MA in the name refers to the MAguro fish. are ocean-dwelling carnivorous fish in the family Scombridae, mostly in the genus Thunnus. Tuna are fast swimmers—they have been clocked at 70 kilometres per hour (43 mph)—and include several warm-blooded species. Unlike most fish, which have white flesh, tuna flesh is pink to dark red, which could explain their odd nick-name, "rose of the sea." The red coloring comes from tuna muscle tissue's greater quantities of myoglobin, an oxygen-binding molecule. Some of the larger species, such as the bluefin tuna, can raise their blood temperature riri above water temperature through muscular activity. This ability enables them to live in cooler waters and to survive in a wide range of ocean environments. A remarkable aspect of Thunnus physiology is its ability to maintain body temperature above than that of the ambient seawater. Canned tuna was first produced in 1903, quickly becoming popular. Tuna is canned in a variety of edible oils or in brine. The most important harbors for maguro are in Ooma　大間, Aomori, and in Misaki　三崎, Kanagawa 三崎まぐろ. are extremely long, highly specialized knives used in Japan to fillet tuna and other large fish. The hancho hocho is also sometimes called a maguro kiri ( マグロ切, "tuna-cutter"). shiro maguro (白鮪) Binnaga orBincho (鬢長) "white tuna"
yokowa maguro ヨコワまぐろ　meat from the ribs of very young bluefin tuna, not more than 3 kg of body weight. baby tuna, young tuna. Served as sashimi in Fukuoka. Ein alter Name für Maguro ist in Japan SHIBI　鴟尾; 鵄尾; 蚩尾, er stammt aus dem Chinesischen. Diese Bezeichnung hat sich übertragen auf die fischschwanzförmige Verzierung der Endziegel auf dem Dachfirst eineswichtigen Gebäudes, zum Beispiel Schloss oder Tempel. Dieser „Fischschwanz“ soll als Repräsentant der Gottheit des Wassers das Schloss oder den Tempel vor Brandgefahr schützen. Daraus hat sich dann auch der shachihoko しゃちほこ Ziegel entwickelt, ev. auch allgemein der "Demon tile" onigawara 鬼瓦. Mehr in der WIKIPEDIA ! Lately sold at Tsukiji Fish Market in Tokyo for rather cheap. メバチマグロの幼魚です. supposed to be the baby of a mebachi maguro. katsu　uo　勝つ魚 "fish to win" - its name was an auspicious one, therefore it was well loved in Edo. The first catch of the season. First things were much loved in Edo and people payed high prices to get them, some were even first offered at a shrine before consumption.
. WKD : First Things . He was a disciple of Matsuo Basho. We can enjoy a lot for free in spring, but the first katsu fish is just sooo expensive. Among the choicest of the hatsumono (first products of the season), bonito was loved the most by people in Edo. Especially from the Meiwa and Anei (1764-1781) to Bunka and Bunsei (1804-1830) when there was a bonito boom which drove up the price of tuna to startling levels. According to the recordings of representative writer of the Edo period Nanpo Ota (pen name Shokusanjin), in the third month of 1812 (9th year of Bunka), 6 out of 17 of the bonito brought to the Nihonbashi fish market were delivered to the shogun household, 3 to a famous restaurant Yaozen for the price of 2 ryo and 8 were handed to fishmongers and of these, one was bought by kabuki actor Utaemon Nakamura for the price of 3 ryo.
. senryuu, senryū 川柳　Senryu in Edo . The vendors started to come around in the fourth lunar month. They took a risk like any street vendor, but their risk (shoobu) was rather small, since most Edoites would pay any sum to get this fish. The vendors were so busy, they did not take the time to put their shoulder poles down and place the tubs on the ground. Still, they made their best business while just walking around, calling out their merchandise. He had eaten skipjack before crossing this dangerous pass and now remembers this meal fondly. 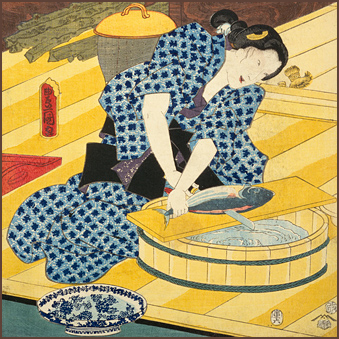 A fish peddler cuts a katsuo for the ladies. 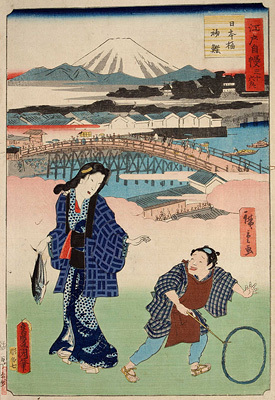 伊勢参りと女魚売り　A man on the Ise pilgrimage and a female fish peddler. She carries a bandai 盤台 barrel with 鰹 Katsuo and awabi 鮑 abalones. First tuna fish was the IKI　粋　of Edo! 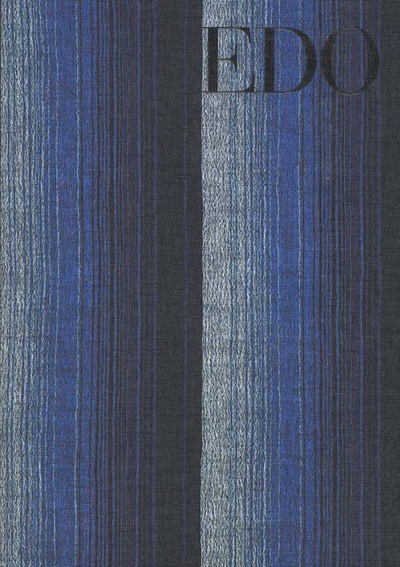 There was even a kimono pattern in its honor.
. - - - Welcome to Edo　江戸 ! - - - . "Nice, Gabi! I love Maguro, Hirame,Sake and Hotategai...Sashimi"
Thank you dear Gabi san... yummmyyyy with a wasabi "kick"!! The Marine Stewardship Council, which assesses fisheries world-wide and issues its eco-label to those it certifies as sustainable, currently lists 86 such fisheries, including three tuna fisheries — or four if skipjack tuna is included. They are: The American Albacore Fishing Association (AAFA), the American Western Fishboat Owners Association (WFOA) and the Canadian Highly Migratory Species Foundation (CHMSF) — all three of which fish for albacore in the North Pacific, although the AAFA also takes them from the South Pacific. Are Japan's fish lovers eating tuna to extinction? 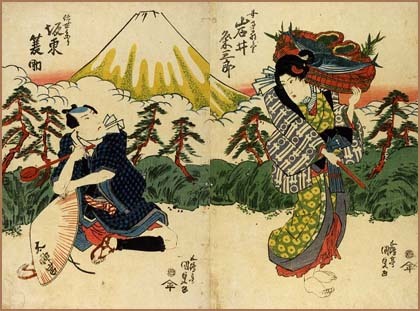 This summer hokku is from the end of fourth month (early June) of 1820. In Issa's time bonito or skipjack tuna was considered a delicacy and was very popular with people living in Edo. In early summer, when the first northward-swimming bonito of the year arrived in the Pacific off Mt. Fuji and Kamakura, south of Edo, the bonito caught off Kamakura were immediately rushed live on horseback to the fish market in Edo. Not only was the fish delicious, but it was believed that eating one of the first bonito of the year would add weeks or even years to your life, and because of the demand, the price was very high. Even a few slices of bonito were considered a feast by most ordinary people. 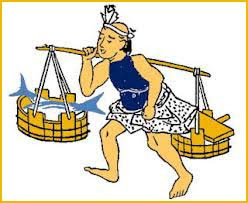 The local rich man or power broker who seems to be evoked in the hokku, however, lives in another world, and he must have paid a small fortune to buy the several bonito that now, sliced, cover the table or trays in front of him. Or perhaps he has received several bonito as presents, for which he will later return the favor. The word taishou in the first line means literally 'military leader; general,' but in Issa's time commoners often used this word in several non-military senses. It referred respectfully to the male or female head of a group, such as an organization head, a construction site director, or the owner of a large firm. 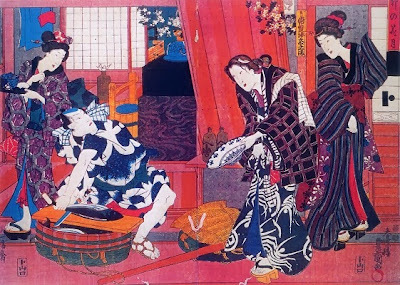 It also referred to any esteemed local person who had power or prestige in the neighborhood or community, including even high-ranking courtesans in the Yoshiwara licensed quarter. By extension, it was used to respectfully but playfully refer to or address people you knew well and wanted to praise -- or perhaps playfully chide, since it could refer to the leader of a gang of young boys. Even in modern Japanese it is still sometimes used to refer to the head of an organization or group, to the owner of a sushi bar, to the head cook at a restaurant, to actors and actresses, or to the director of a kendo fencing contest. Ema votive tablets of the famous katsuo bonito and the sashimi speciality of Tosa.